The Smoky Mountains area around Gatlinburg – gateway to Great Smoky Mountains National Park – offers an abundance and diversity of plant and wild life, not to mention stunning views and scenery that truly earn the term breathtaking. But you don’t have to be a seasoned hiker to get out into this vast display of nature. There are many ways to explore these natural attractions, and we’ll try to cover all of them here. 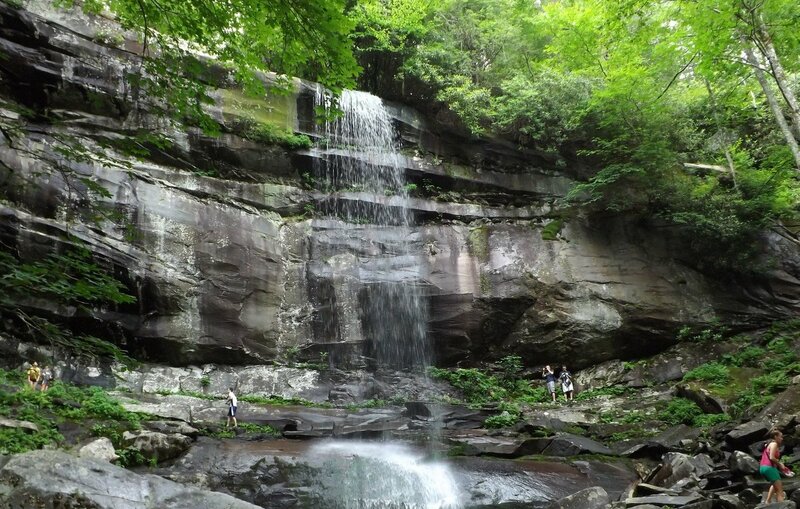 This is our guide to some of our favorite and less well known hikes, walks, strolls, guided tours, shuttles, scenic drives, chair lifts and other surprising ways to plunge into nature when you’re in Gatlinburg. More than 10 million visitors come to Great Smoky Mountains National Park each year, and park rangers have created some wonderful ways for every type of person to enjoy this national treasure whose stewardship they are entrusted with. There are little-known paved nature trails that a children’s stroller or even a wheelchair can access, there are waterfalls you can drive to, there’s an amazing scenic nature trail created just for cars. There are many ways to enjoy the natural beauty of the Smoky Mountains on a trip to Gatlinburg and the surrounding area. There are rental cabins surrounded by trees and with stunning views of the mountain ranges, and some are even by streams – many are in resort clusters with amenities such as swimming pools, and some even have their own indoor swimming pool. It’s easy to understand – from a rocking chair, swing or hot tub on the cabin deck – that you actually are already in nature. But let’s leave the cabin and venture out into a bigger land. And first of all, before one even gets to the national park, let’s remember the public parks and beautiful attractions of the towns in the area. Here’s our guide to public parks in Gatlinburg and Pigeon Forge. This is the central and most crowded part of the area, but there are more peaceful zones too – Wears valley offers cabins and the quiet side of the Smokies, with an entrance into the national park, also to Cades Cove, the most visited area of the park. We’ve created guides to many of the attractions on this side. In the other direction, to the east, lies Cosby with a campground and easy walking trail that is rarely crowded, and is enormously beautiful. There are chairlifts to know about, as well as nature ropes courses, ziplines, zorbing, and also museums, the Aquarium, the Rain Forest Zoo, and Parrot Mountain. There are also important events each year, open tot he public and dedicated to learning more about this unique ecosystem of Great Smoky Mountains National Park. And there are scenic drives in all directions. Cades Cove is a destination for millions. And you would need to study all of our guides to the park to glean all the scenic drives and hikes. You should at the very least know about the Roaring Fork Motor Nature Trail. Here are campgrounds, picnic areas, walks that range from easy to hard, mountainous terrain, backcountry territory. There are more than 800 miles of trails leading to cascading waterfalls, beautiful vistas, and quiet meadows. The trails wind through deep forests, on high ridge tops, and along rushing streams. See our Hiking in the Smokies guide for a Great Smoky Mountains National Park map that shows all the trails, with our listing of some of the best Smoky Mountains hiking trails. It’s all free to explore.